This mandate…doesn’t seem to take into account those birds that escape confinement and adapt to new environments. So many of our local species (can you say House Sparrow?) were intentionally introduced into the ecosystem. At what point does a bird wash off the stink of human collusion and become accepted as a wild creature again? I am of the opinion that birds who have paid their debt to society should be accepted into nature unconditionally. A few months ago, we spotted a peacock (Indian Peafowl) running wild in Potter County, PA. This bird obviously had escaped confinement and gone native; rumor is that the peacock weathers the harsh Pennsylvania winters surprisingly well. Why couldn’t we add the Indian Peafowl to our life list? It is, for all intents and purposes, part of the ecosystem now. Although our decision may be challenged, we are comfortable adding the Muscovy Duck as lucky number 200 to the life list, at least for the time being. At what point a domesticated bird becomes wild is anybody’s guess, but in this case, we’ll go with organizers of the Central Park BioBlitz. They respect the muscovy duck’s place in the ever-changing ecosystem of Central Park, so why shouldn’t we? Why shouldn’t we? Because, for one thing, the American Birding Association says so. More importantly, because now that Sara and I have a few years of birding under our belt, we enjoy a more nuanced appreciation of introduced and invasive species in an ecosystem. The currency of bird watching, its purpose and provenance, is wild birds, emphasis on the wild. For birding purposes, wild means that the bird’s occurrence at the time and place of observation is not because it, or its recent ancestors, has ever been transported or otherwise assisted by man. When a rare or unexpected bird pops up hundreds or even thousands of miles outside its accepted range, one must consider the events that brought it to that place. The foreign visitor blown astray by ocean storms or led amiss during migration can be, nay should be counted with great alacrity and enjoyment. The cage bird or farm stock that slips the noose of confinement, alas, can not. This latter category of bird, essentially chattel, can make good as an accepted member of its adopted ecosystem if and only if it descends from an established feral population. This means that the fugitive itself will never be countable, no matter how many years it thrives outside captivity. That Muscovy frequented Central Park for years; you might see it there today. However, while it certainly was as free as the mallards and black ducks with which it kept company, it simply wasn’t as wild. The same applies to the first Monk Parakeets that infiltrated North American ecosystems, the ones rumored to have escaped from a shipment of pet birds bound for New York. Birders who encountered these lovely parrots in the 70’s or 80’s couldn’t count them, even as they spread to urban centers across the U.S., wreaking havoc on power lines up and down the East Coast. Today, however, certain populations have achieved the level of stability required to be deemed wild. This means they count from a birding perspective, a fact that undoubtedly fills these parrots with pride. Thus, neither the Muscovy from Manhattan nor the peacock from Pennsylvania have a place on my birding life list, except in the section set aside for exotics. I removed that dapper duck, formerly the 200th bird on my list, with regret, but it doesn’t bother me anymore. The sight of a escaped avian free to do its own thing, to just be a bird, is pleasure enough. It is instructive to observe the ways our personal listing tendencies change over time … and the ways in which birders’ preferences differ. Some birders are proud not to list “introduced” species at all, but they will count REintroduced species, sometimes even if those populations aren’t countable by ABA standards. To ignore some of the more successful avian species on the planet while ticking populations that would collapse without intensive human maintenance and intervention is quixotic. It’s looking at things the way we wish they were rather than the way they actually are. So we shed a tear for your muscovy, but hang on to those Monk Parakeets … because you can bet that they’ll be hanging on. I keep escapes like Muscovy duck and Egyptian goose among my records, so they appear on my lists, but I wouldn’t include them on any “official” lists submitted to birding organizations. As for the question of wildness, I think determining what is wild and what is not is very difficult in an urban setting, even going beyond birds that recently escaped. For example, Union Station in DC is a great place to see common “trash” birds like ring-billed gulls, house sparrows, starlings, pigeons, and so on. They are all “countable,” from an ABA-type perspective. At the same time, these birds seem almost completely dependent for food on handouts and refuse since there is little natural habitat in the immediate area. Can those really be considered wild? Of course, there are other gradations of wildness in other parts of the city. Funny you should use Muscovy as an example Mike as I believe its about to be added to category C of the british list and therefore be deemed properly wild by our listing authorities due to sustained breeding of the escapees. Why we should expect an organism to agree with us that it’s in the wrong place is truly puzzling. Once present in an ecosystem, and as long as it survives (longer, as a meal or detritus) it is part of that ecosystem. It eats, it excretes, it occupies space; if it can find a mate it may reproduce. Consider the case of Ruddy Ducks in Europe, anathema to nativists because they are despoiling the genetic purity of White-headed Ducks– even though the latter don’t seem concerned, and their ‘hybrid’ offspring appear perfectly viable. What is actually lost in this process? Tradition? A sense of place? Local pride? Diversity for the sake of diversity? Perhaps we’re projecting our own cultural fears a bit too far. In North America, Blue Jays and Steller’s Jays hybridize where their ranges now overlap (due to the urban afforestation of the prairies). Some now wonder aloud whether they should be lumped together into a single species. The authority of the ABA, the AOU and other such groups is self-declared, and within each there are factions with different views of various taxonomic problems. Remember the green-backed heron debacle? Or the more recent general reclassification of juncos? The great-tailed grackle didn’t exist (per the checklists) until 1973. Anna’s hummingbirds and Canada geese became year-round residents in the Phoenix, Arizona area at about the same time. Wherever the ‘truths’ of taxonomy and biogeography lie, a majority vote during some annual meeting obviously does not insure that we have arrived at them. I guess it depends on the point of listing. ABA and AOU listing is a sport with rules specific to the sport. But there are other reasons for me to make a list. For example, if I want to keep track of what is happening in say, the Watchemocket Cove ecosystem, then I am going to list the pair of domestic geese who showed up there, nested, and produced an offspring along with the buffleheads, goldeneyes, hooded mergansers, American widgeons, Eurasion widgeons, canvasbacks, Canada geese and so on. Similarly, if there are 3 black-headed gulls hanging out with a flock of 200 ring-billed gulls, it ain’t only the black-headed gulls that get written in my notebook. Birds are birds and they are where they are. An adaptable native bird like the ring-billed gull, which came back from near extirpation by the millinery trade like other gull species, is only considered a “trash” bird because it’s common. Other birds are considered “trash” because they are introduced and/or invasive or just because they irritate people (like the blue jay). A “good bird” is “good” in birding-ese because it doesn’t belong where it is being seen. A black-headed gull is a “good” bird in Massachusetts precisely because it doesn’t live here. The same bird would be a “trash” bird in downtown Reykjavik. Listing is different from birding. There’s a lot of thought-provoking commentary here. David’s points about changing listing tendencies and John’s thoughts on wildness in urban environments are both issues worth pursuing. I especially appreciate Janet’s comment that listing is different than birding. One thing I like about birding as a sport is how wrapped up it is in biology and ecology. Listing is a taxonomic application of the same. Matt, you’re absolutely right about the role any individual plays in the ecosystem it finds itself. The ABA could yell until the collective membership turned blue and that wouldn’t change the fact that my Muscovy Duck was dabbling in a pond in Central Park. The issue, it seems, hinges on when an organism, and by extension the population, becomes a self-sustaining part of the ecosystem. 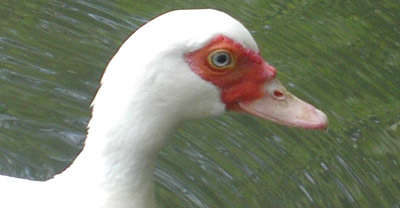 Muscovy Ducks don’t breed in Central Park. The issue of diversity is another ball of wax altogether. I have to admit that I was really surprised last year when I learned that the Ruddy Duck is considered one of the most dangerous invasive avian species anywhere. But displacement of native species by invasive or introduced ones is a valid concern, particularly when ecological balance is such a poorly quantified phenomenon. Again, the Central Park waterfowl population is hardly under seige by an expanding flock of feral muscovies. Somehow, I doubt the Mallards or Canada Geese are worried!